Northeast Coast is hill area. About one hundred year ago, hill towns were built for mining of gold and coal. Nowadays, mining is no more, but traditions and scenes remain.Let's enjoy the one-day trip. Pinxi (Railway) Line was built in 1921 and was designed for carrying coal. There are 7 railway stations on the Pinxi Lines, including Pinxi & Shifen, and Shifen is the bigger one. There are still some mining factories alone the line Band its old-fashioned factories and trains stations make Pinxi Line popular for traveling. The most famous attraction of Pinxi Line is the sky lantern. About 150 years ago, robbers were so common in the hill area. Most residents took refuge out side of their villages when robbers came. After robbers left, the people who hid in the village would light the sky lantern to inform their family to come back. Today, sky lantern becomes an attraction. You can write down your wish on the sky lantern and your sky lantern will bear your wish to the sky heaven. If you visit Taiwan between CNY and Sky Lantern Festival, 15 days after CNY, you can also join sky Lantern celebration which is held by the New Taipei City Government. The government usually will hold 3 times of group lunching sky lantern activities. The last one, the biggest, is held on Sky Lantern Festival at Shifen. The dates of first and second activity are different year by year, according to the day of weekend of holiday in Taiwan. There will about free 10 rounds of group(ranging between 50~100 people) lunching sky lantern at each activities. If you are not able to register for the group lunching, you also have the high opportunity to join the group lunching since lots people may leave if their lunching orders are late. The will be direct bus between MRT Taipei Zoo Station & the activity location. There will be 2 waiting lines for the return bus, one for seat and another line for standing. You can wait in the line for standing if you don't mind standing 30 minute in the bus. For more information about the Sky Lantern Festival, please visit the official website. 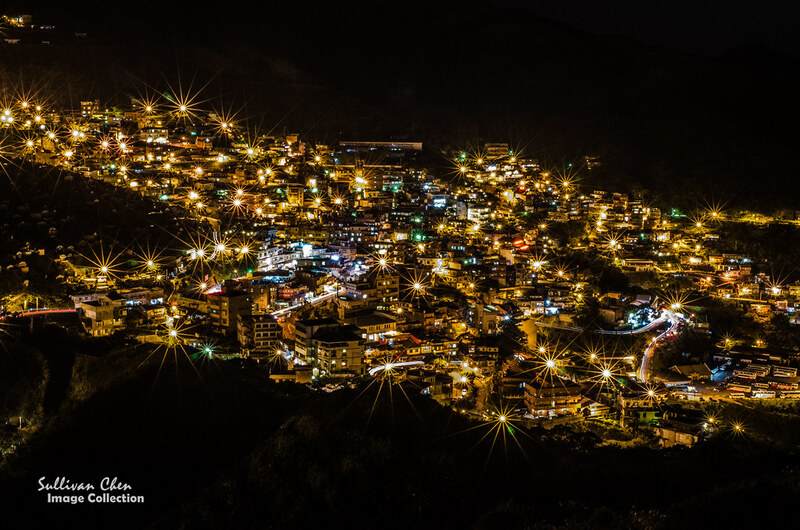 Jiufen is famous for its gold mining town. JiuFen is a hill town which overlooks the rugged coastline. 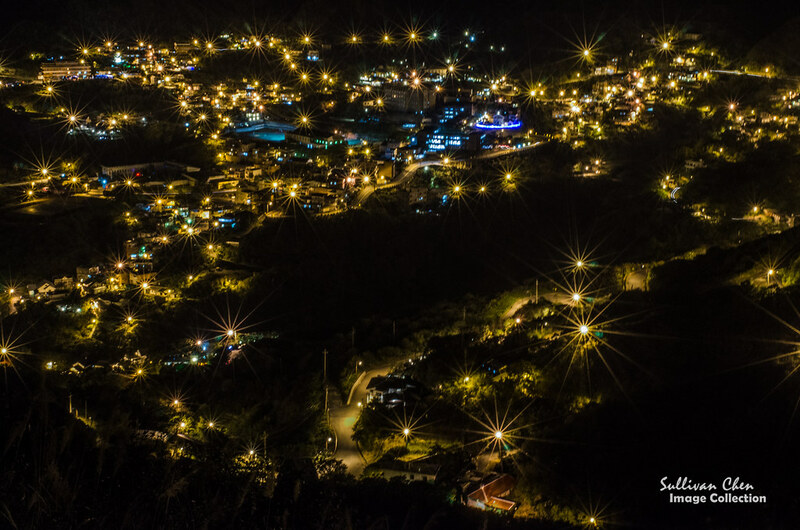 JiuFen was prosperous because of gold mining. It was the entertainment center of gold miners. Now bars become tea houses and the theater becomes a museum. It is said that Jiufen inspired Miyazaki Hayao's animation 'Spirited Away'. 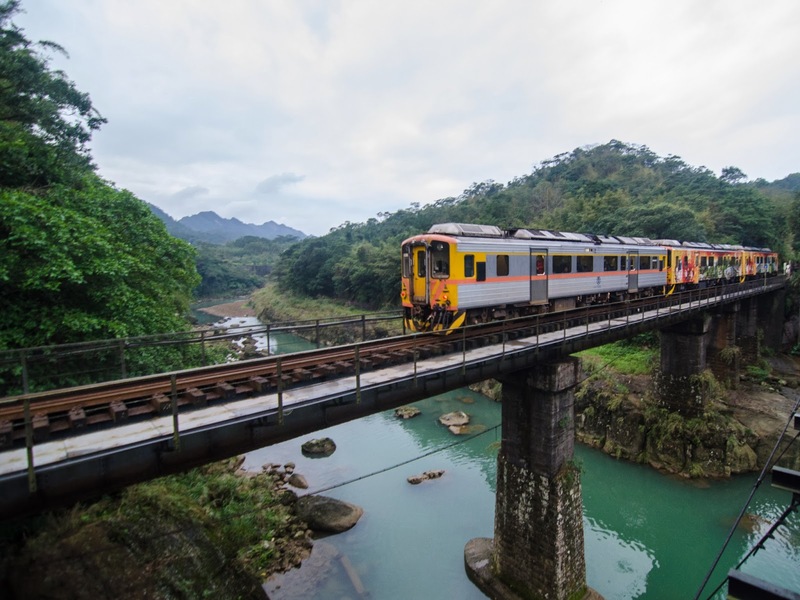 The most popular transportation to visit Pingxi, ShiFen & JuiFen is train. However, you can combine bus and train. In the map, the red line is the train line and the blue line is the bus line. You can take Taiwan Tourist Shuttle Bus to ShiFen from MRT Muzha Station. In weekday, there are 10 shuttle buses for each way and there are 22 shuttles in the weekend. If you want to go to JiuFen from ShiFen, you have to take train to Ruifan and transfer to JuiFen by bus. There are many many bus lines to JiuFen and the bus interval is about 15 minutes. You can ask for help from the staff of visitor center in Ruifang Railway Station. The itinerary could be flexible. You can have a one-day trip. You can also have a two-day trip if you will stay in Jiufen for one night. The major purpose of following itinerary examples is to demonstrate how to use timetables of Train & Bus, which are at the bottom of this blog, to make you itinerary. 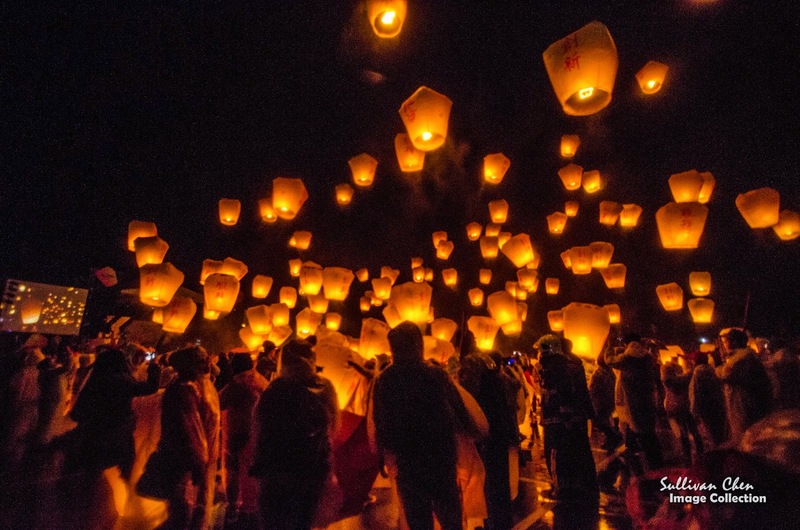 Be noted that if you plan to go to the Sky Lantern Festival, including Jingtong, Pingxi, Shifen event, the itinerary arrange may not be the same. Please refer to another blog Pingxi Sky Lantern Festival. 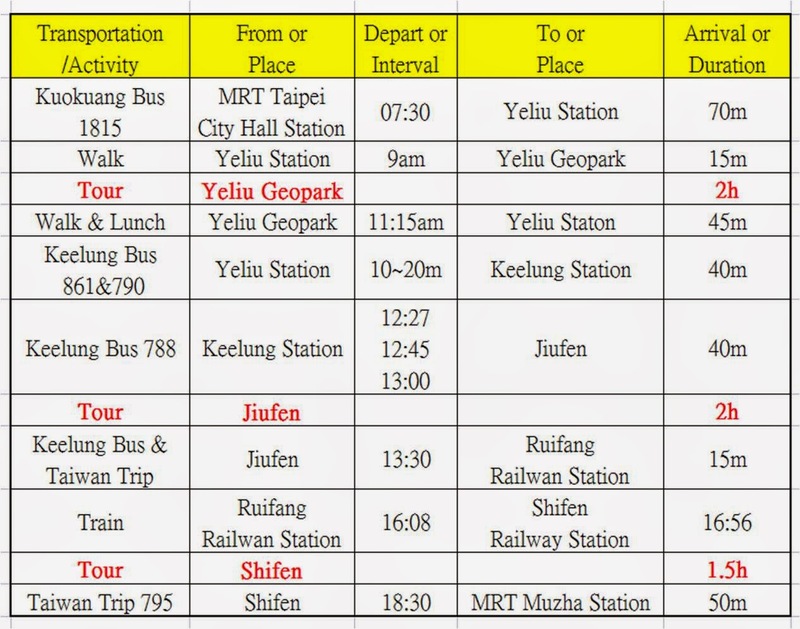 The following itinerary includeds Yeliu, Jiufen, & Shifen.This is a counterclockwise itinerary Although it is doable, but you cannot control the arrival time of bus, which you can check the real time GPS of the bus. (ios, android), you should notice the time. Although almost all of your information tell you that you can take Kuokuang Bus 1815 at Taipei West Bus Station Terminal A, which is near Taipei Main Station. However, I suggest you can take Bus 1815 at MRT Taipei City Hall Station for some reasons. You need to walk from MRT Taipei Main Station. It take about 15 minutes. However, the underground is a maze. It takes more time for a foreigner. The bus station of MRT Taipei City Hall Station locates at the ground floor and easy to find the platform. From Taipei West Bus Station Terminal A to MRT Taipei City Hall Station, the bus should go across the Taipei city center. 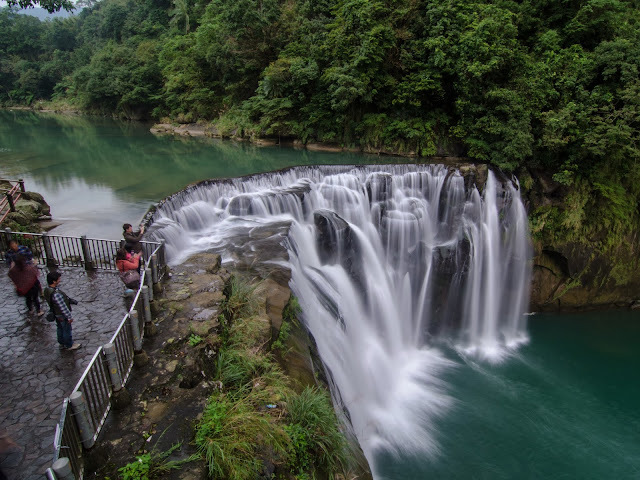 The following itinerary includes,Jintong, Pingxi,Shifen, This is a counterclockwise itinerary. You can go to Keelung night market or go back when you finish your tour in Jiufen. As mentioned at the beginning, this is just a example to show how to use the time tables. In fact, Jintong, Pingxi & Shifen are similiar. You can skip one or two. You can also enjoy Maokong Gondola or go to Jinquashi. * It takes about 20 minutes from Keelung Railway/Bus Station to Maokuu Night Market by walk. If you will not visit Yehliu, you can travel counterclockwise(MRT Muzha Station first) for the following reasons. The next bus from Shifen to MuZha after 18:00 is 19:50 in the weekday. 20:35 is the last one. The train interval from Ruifan to Taipei is about 20 minutes in average. The light of sunset in Jiufen is greater for photo. You can find more more itinerary examples of Yehliu, Pinxi, Shifen & Jiufen in the following list. 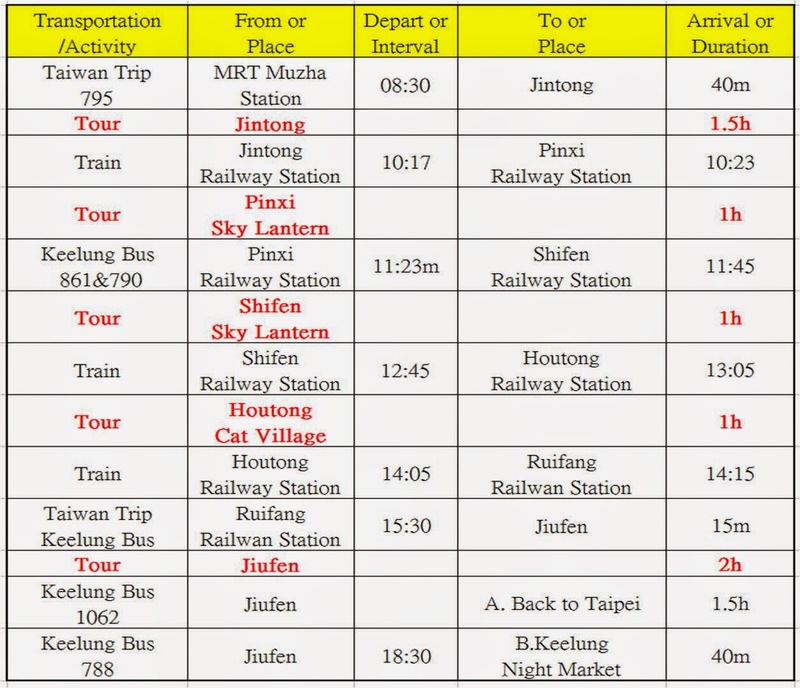 For more itinerary examples of other areas, including Taichung, Nantou & Chiayi, etc , please refer to Area Itinerary Examples. I would like to have one day trip and I think your itinerary is very good. I am Chinese born Indonesia and can speak Chinese. My most concern is about the in transit walking way, would it be very trouble? And also, could you recommend the place where we can have lunch? so that we won't spend many time looking for restaurant or places for lunch. 3.Take taxi for some parst of the itinerary. Not much cost but save you lot time and ensure that you have have seats. 4. You can install app "台北好行" or "Fun travel in Taipei" in your smart phone. The app provide the real-time GPS of buses. I am planning to go Yehliu, Shifen then Jiufen to catch the sunset at Jiufen. Are there taxis available at Yehliu to go to Shifen directly? On google map, by car is about 1 hr. By train and bus is about 2 hrs. Also can we buy advance bus tickets back from Jiufen to Taipei City on bus 1062? 1.There are some taxis in front of Yehliu Geopark. Bus/Train need a lot of time in waiting transfer. Taxi would be a better choice, although I don't recommend visit Yeliu & Sifen/Jiufen in the same day. 2. You cannot book bus 1062 in advance.. So we will need to queue for these buses and we just have to wait for the next bus if we can't get on? Is there anywhere to get a link to the bus1062 time schedule? hello! i am planning to do the yehliu jiufen shifen one-day itinerary. i noticed in your sample table that duration of bus 795 to muzha station is just 50 minutes? but i checked google maps and it says 3 hours and 30 minutes? which is the correct duration? You can check the distance. Only 28km from Muzha Station to Shifen. Hi! Thanks for this very informative post. 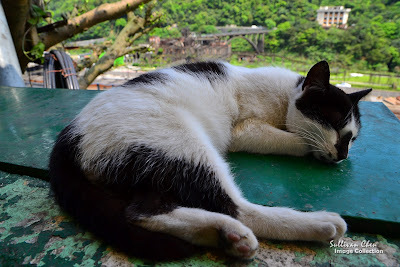 Would like to ask for your help on the bus/train route fro Yehliu Geopark to Jiufen Old Town? Thanks again! Hello. I have some questions and hope you will be able to help me with. We will be travelling to Taipei at the end of this month and am looking at a day trip out on some places along the Pingxi Line. We have in our group 4 older folks who have some knee problems, so they cannot walk too long or climb too many steps. 1) Is it advisable to go to Shifen and visit the Shifen Waterfall ? 2) What are the places that we MUST go to along the Pingxi line? 3) If we choose only Shifen and Jiufen is that good enough? 1) Yes, you can if you take bus 795 to Shifen Visitor Center. The center is closed to Shifen Waterfall. You can take bus 795 back to Shifen. 2) If there are 4 seniors who have some knee problems, you can go to Jinquashi after Shifen and before Jiufen. The view alone Pinxi line are similar. 3) Shifen & Jinquashi are enough. If you leave Shifen before 12pm, you can go to Jinquashi as well. 4) There are lots attractions in YMS. You can go to Zhuzihu or flower clock. Climbing won't be a problem. However, weather may be cold in winter. Hi! Thanks for this wonderful and very informative post. Seeing as you reply to comments, please advise me on my I'm planned itinerary. Do you think it's doable? You will waste lots time go around and it may not not doable. Hi, thanks so much for your information! May i ask your opinion whether my itinerary is doable or not? I plan to do one day trip from Daqiaotou station -> Ruifang station - Shifen - Pingxi - Ruifang - Jinguashih - Jiufen - Ruifang station - Daqiaotou station. 0. Does pingxi worth to go? If i visit Shifen as well? 1. Is it better to visit Jinguashih or Jiufen first? 2. How to go to Jinguashih (From Shifen OR Pingxi train station)? 3. How to go to Jiufen from Jinguashih? 4. Is the attraction in Jinguashih (黃金瀑布-Golden Waterfall , Gold ecological park, 陰陽海-Ying Yang sea ) are within walking distance from public transport? 5. How to go to Ruifang station from Jinguashih? 6. How to go to Keelung night market from Yehliu geopark? 7. How to go from Keelung night market to Taipei? 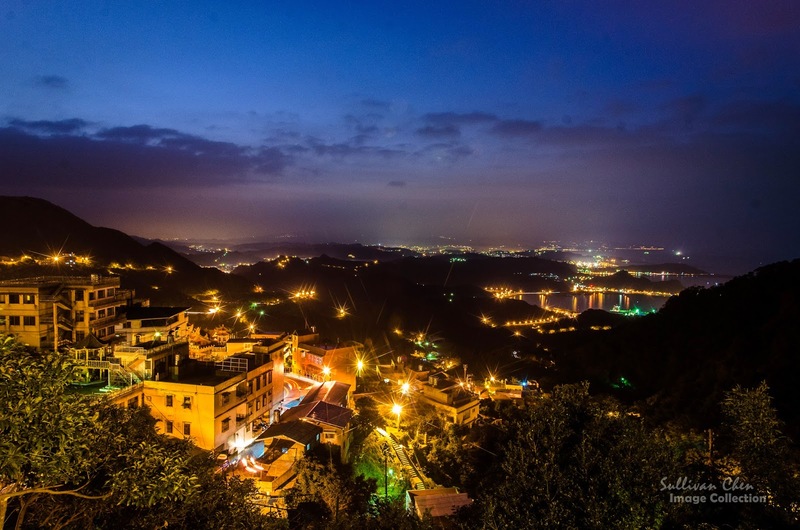 1.Visit Jinquashi before Jiufen since the sunset at Jiufen is beautiful and nothing to see at Jinquashi after sunset. 2&3.Take the same bus(825/856/788) to Jiufen. Some bus lines terminals are located at Golden Museum(Jinquashi). 4. You can take bus 856 from Ruifang Station. Bus 856 extends to Golden Waterfall, Ying Yang Sea. If you take other bus lines, you have walk from the museum and I won't suggest walking. Do you know the bus timetable for 788 and 825 last departure? Also the frequency of 788 and 825 bus? If i plan to start going down from JIUFEN around 7pm, does 788 and 825 bus still available to bring me back to Ruifang station? Yes, one stop before Keelung Station by 788. Cause you need to transfer at Keelung Train Station when you go to Jiufen from Yeliu, you will take 788 twice. You can what the location of the stop. There are many bus line between Taipei & Keelung, eg. 1813/2088/1573/ . But you can not take the bus at the night market because of different direction. You can check the bus that stops most closed to your hotel. If i travel from Taichung. 3) Stay a night at JiuFen. Which should i go first? How to take the transportation to reach to those places? Hi, can I check if this itinerary is possible? If i want to be able to enjoy the Shifen waterfall before it closes, what time is recommended for me to leave Taipei main station by the kuokuang bus? Thank you! Hi, if i follow your 2 days itinerary with public transport for parent with 2 kids will it be suitable? Thank you. One days is better since Jiufen and Shifen are close. I'm planning to book a private tour for my trip as there's a lot of people 8pax in total. Could you suggest me an itinerary i can use? I plan to depart from Taipei city & will stay a night in Jiufen before going back to taipei city the next day by noon. You dont need to hire a cab all the way, but hail a cab on your way for parts of your itinerary. For example, from Yehliu to Keelung, from Keelung to Jiufen. Thanks for your guidance it helps much. Taipei main station or some station in taipei > Pinxi (Just for take train to see view. is it beautiful ? is it worth it to see from the train ? ) > Shifen waterfall > Jiufen > Keelung NM > Taipei City. İs it good enough for 1 day and is itinerary right ?if its not doable can you advise us? could you advise for train/bus numbers? Which stations must be start and finish and what is last veichles time to get taipei. I bothered you sorry. Thank you in advance. So you dont advice us the pinxi and pinxi train? i'll note that. I didn't know about Raifang. Is it different ? if its worth to see how many hours it takes ? Can you tell last hours for vehicles jiufen> keelung and keelung > Taipei ? Thanks a lot. Hi! I will be intaiwan nxt week. I did not book any tour/trip since im not comfortable with the time. Can you help me with the trabsportation from taipe main station to yehliu. Then from yehliu to shifen. Then from shifen to jiufen. I'd like to see how beautiful jiufen is at night that's why it will be my last stop. Thanks! Hi, I'm planning to buy a Taiwan Fun Pass which will give me unlimited rides with Taiwan Tourist Shuttle Bus. Is your itinerary for Yehliu, Jiufen and Shifen all used with the tourist shuttle bus? I'm also planning to pass by the yin yang sea and the golden waterfall. Would you know if the bus is passing by it? Many many thanks! Taiwan Fun Pass does't cover all public transportation. 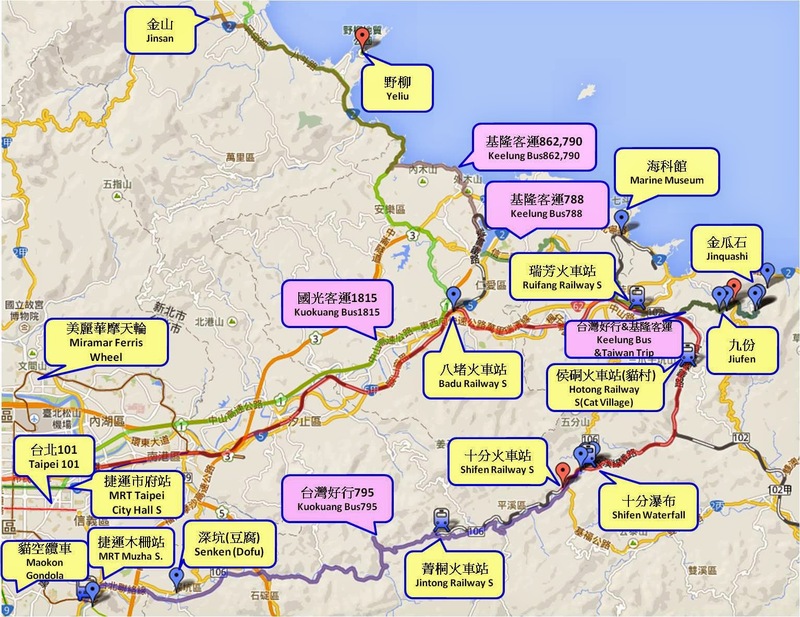 For example, it doesn't include the bus(1815) between Taipei & Yehliu and the train between Ruifang and Shifen.